One particularly dreary day last week, I trudged to class, grimacing at the gloomy weather. The sky was dismal and gray, and everyone I passed seemed to be in a funk. Girls sporting limp ponytails and Nike Tempo shorts littered the streets; clearly, it was not a great day for style spotting. Then, against the bleak background of rain clouds and sweatpants, Alison‘s cheerful, cozy outfit popped. I knew at once that Alison’s unique style made her the perfect candidate for Looks on Campus! Okay, so, let’s get one thing straight: I love mismatched things (and, if they’re asymmetrical, even better!). So I really love Alison’s collection of rings. The mix of styles, metals and textures urges you to take another look at her subtle fashion ingenuity, encouraging you to actively seek out the understated elements of her look. Alison’s earring add class. Dating back to the 1930s when her grandmother first wore them, the earrings give Alison’s outfit some elegance without seeming overbearing or out-of-place. 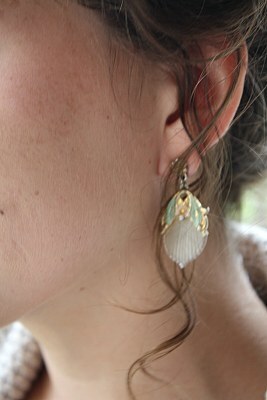 In combination with the rest of her pieces, Alison’s earrings make her outfit feel timeless and classic. 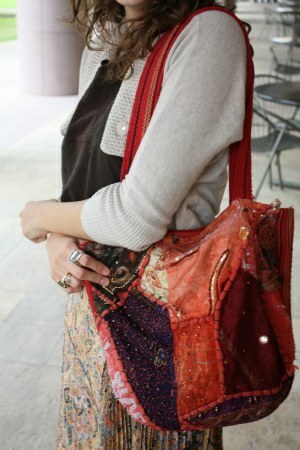 Last but not least, I adore Alison’s boho chic tote bag (which she set aside for the full body shot). The patchwork pattern of various materials makes for a whimsical way to carry your books to class. While it’s no Hermes Birkin, Alison’s bag is playful, vibrant and totally perfect for the college fashionista. Do you like Allison’s outfit? Do you agree with her thoughtful answers in the interview? 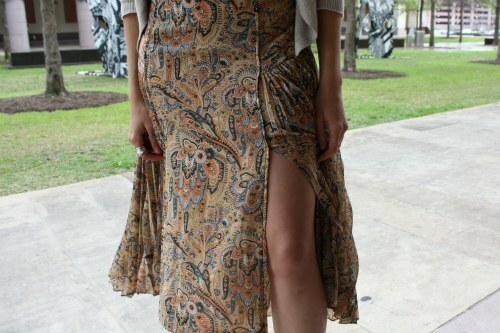 Will you wear long skirts this spring? Do you like her earrings and rings? Let us know with a comment!